I have used the above link to lodge my greviance against the state of infrastructure. I received a registration number for the same via email. At this moment, I do not know how effective it is. However, I thought it was worth trying out. I would request all Indians to give it a shot. I am pretty sure every one of us is facing some issue or the other due to the incompetent nature of our public adminstration. Let us start questioning them. It just takes few clicks on your computer keyboard to initiate the process. There is nothing to lose. Five minutes of your effort could solve big problems faced by many of us. I have taken a step and would request every one to do the same. Also, after reading this blog if someone lodges a complaint, please make a comment on my blog post about your experience (positive or negative). I would be eager to know the effectiveness of DAR&PG. Let us all fight for a better managed India. Elections 2009 was something everyone was looking forward to. An election just after the worst ever terrorist attack on India was sure to attract attention. The Congress and the BJP may never have fought an ugly battle like this. They blamed each other for being lax on terrorism. The projected Prime ministerial candidate of the NDA Mr. L. K. Advani targeted our PM Manmohan Singh for being weak and playing second fiddle to the Congress leader Sonia Gandhi. 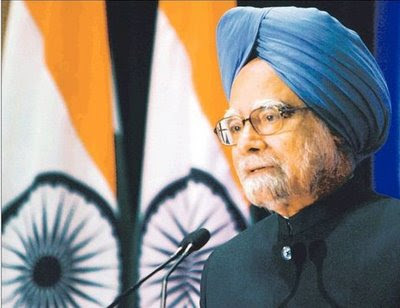 However, when Manmohan Singh chose to react by citing the stand taken by the NDA government on hijacking of an Indian Aircraft by terrorists, Advani didn’t seem to have a proper answer. I am neither a big fan of the Congress nor of the BJP. The BJP simply cannot forget the Ayodhya Ram temple issue. I do not understand how building of a Ram temple in Ayodhya can aid development of a nation. I think this country has more than enough temples and other worship places. We require more hospitals, better infrastructure, and quality schools to improve the living conditions in our country. Yet, to play with the sentiments of people, the BJP continues to rake up the temple issue. There is nothing wrong in being pro Hindu as long as you show tolerance for other religions. The Congress too is not a perfect political party. The ministers from Congress party have indulged in corruption in the past. I am sure there will be few in the new ministry too who will continue the legacy. Yet, I feel that this time around Congress party has the will of the people to amend all mistakes done in the past and focus on the development of the nation. The way ManMohan Singh handled the Indo-US nuclear deal made me think positively about him. He took a strong stance even willing to risk his Prime Minister’s post to go through with the deal. The Left parties were at their blackmailing best. What else do they know to do? The way ManMohan Singh sidelined them was really courageous of him. Prakash Karat with his myopic vision is definitely not a leader worth following. The people of India taught him a lesson. The Left parties saw their worst ever performance in this year’s elections. They deserved it for being anti-development. Once again ManMohan Singh has emerged as a great leader. I only hope he continues to take bold decisions and transform India into a super power, a powerful nation which demands respect from the world.